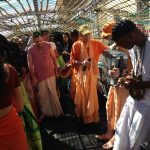 On Saturday morning (01 October), Kadamba Kanana Swami flew from Durban to Cape Town and was joyfully welcomed at the airport by a group of devotees, and we drove to the temple about 15 km away. Later on in the day, we went to Sea Point along the Cape Town coast or as the locals call it, “Let’s go over the mountains.” Cape Town has amazing scenic views and now there were many landmarks all over the city reminding us of the great achievements Nelson Mandela had made, from enlarged steel versions of his glasses looking out to Robin Island (where he was formerly imprisoned) to big skyscraper buildings which had coloured windows in such a way that from the outside you saw a picture of Mandela across the building! 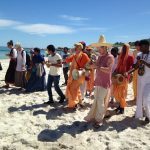 Whilst walking along the beach many would approach us saying, “Hi… Wow… or Hare Krsna,” and we would give a quick response or from time to time Maharaj stopped and greeted and conversed with them like a true gentleman. 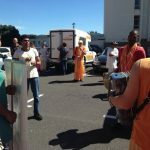 Sunday was an important day for ISKCON Cape Town. You could feel it in the air! Everyone assembled in the temple early & even during class there was loads of vegetables to be chopped, cooks rushing around and people everywhere getting things ready. Why? 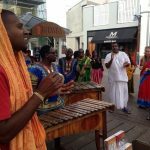 Alongside it being the Sunday Love Feast, on this day was going to be their harinama bus festival for Iskcon’s 50th Anniversary! What does that mean? Well at 10:30am we arrived at a car park near Sea Point & there were two buses awaiting us! One double decker bus and one smaller single storey bus. 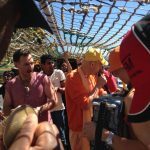 Devotees were bringing prasadam & fliers for distribution and we began to head into the buses as Maharaj began leading the harinama on the roof of the double-decker with Medhavi Prabhu singing on the single storey bus! 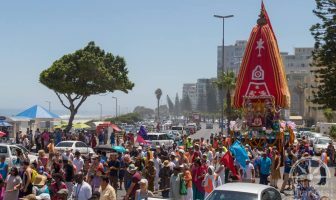 Even before the driver had switched on the vehicle, Maharaj had already taken off – absolutely rocking the top floor with the speakers blasting the Holy name, whompers smashing, mrdangas pounding the atmosphere and people all around inside & outside the bus dancing! Thirty minutes later, we got off the buses to do harinama along the beach! 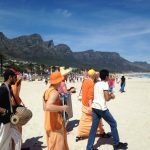 We sang, danced, played instruments loudly & everyone stared, a little shocked and then smiled whilst devotees ran all over the beach distributing cupcakes and the famous Cape Town ladhus! (If you haven’t had one, you have no clue what you’re missing out on! Fly in & get one! It’s worth it!) 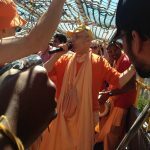 We re-entered the bus and Harinamananda Prabhu (from Australia) began leading a jolly tune. People were waving and singing along with us as the bus went through the town. Maharaj was dancing, glancing & enticing others on the side walk to sing also! What a festival it was! 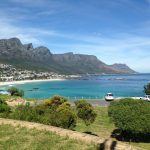 Our last stop was at the famous Cape Town Waterfront were everyone crowded around the harinama party, coming out of shops, restaurants, off the beach and from all corners to see what was happening. Many joined in the singing and dancing & one African band group even began playing along with us when we passed them. Then we all went back to the temple and shortly thereafter Maharaj gave the Sunday Love Feast class. 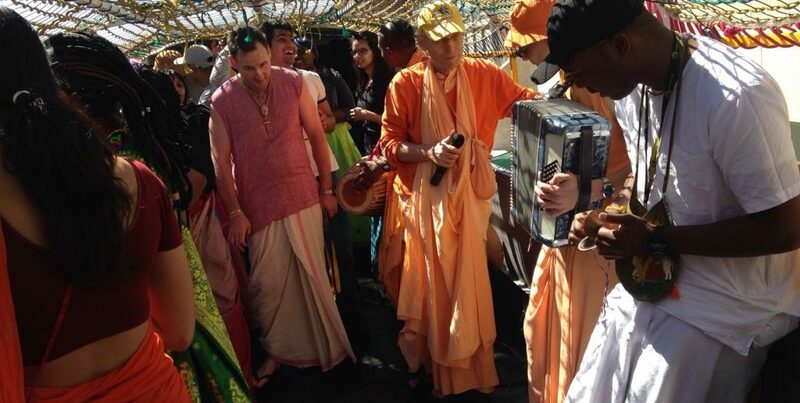 For the first hour or so Maharaj led another roaring kirtan going through a few melodies. Maharaj recited Bhagavad-gita 7.7 & began the class reminding us how we see through our mind which accepts and rejects things but again we chew the chewed. Then a baby began crying & Maharaj said, “That’s enough to make anyone cry!” We try to squeeze the juice but the taste quickly goes & bubbles pop & we are just left with sticky stuff. We see many saints in the world though. St. Francis would walk around and give any of his possessions to anyone who wanted and asked for them. He would embrace lepers. He was full of compassion & kindness. So we see mercy isn’t discriminating. The Supreme Lord is open to all. The mahamantra is the names of Krsna. Krsna means all attractive! Hare, is the energy of service and Rama, is the happiness from that service! But to get that mercy, love is needed and love requires humility to develop. Through genuine honesty, we know who we really are! Through real honesty we receive real mercy. So we must strive for service, humility, love & mercy! And Lord Caitanya openly gives us a direct way back and Lord Caitanya instructed everyone to distribute love of Godhead to all! So Srila Prabhupada didn’t just translate the books but devotional service for all us! Then the class opened up for some questions and Maharaj ended it with saying that the Lord always upholds the words or promises of the spiritual master and will never let them go in vain, like when Brahma gave the boon to Hiranyakasipu. 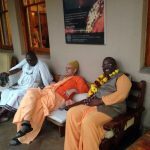 So Srila Prabhupada said, “If you faithfully follow four regulative principles and chant sixteen rounds, you will go back to Godhead!” Afterwards, Maharaj sat outside whilst the feast began and spoke to many individuals. It’s inconceivable to understand Krsna as He is the cause of everything and it’s said that not even a blade of grass can move without Him, yet He isn’t responsible for any of this! Why? Because He didn’t want this world! Actually this world and the different yugas are completely a mirror of our state of consciousness. In Satya yuga everyone was going for self-realization. 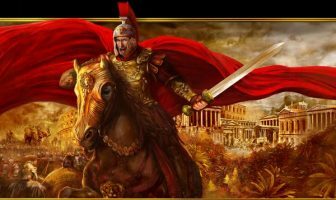 Then in Treta yuga material agendas began. Indeed, there was goodness and piety, however there was more desire to enjoy and lower consciousness began creeping in. Now we are in Kali yuga, the age for those with learning difficulties. So we are all of a lower standard and so the bar is lowered too. This age of Kali yuga is like an ocean of crocodiles (which represent ignorant speculative theories) and only by Mahaprabhu’s mercy can an innocent child swim across to the other side safely. We have difficulties of old habits haunting us and we know they aren’t good or useful but when we think about them or bring them back then spiritual life becomes hard again. Ultimately we place our faith in those places where we are attracted. So we have to look at material life and become convinced that it doesn’t work! We have to consciously cut material attachments. We must develop real friendship with the spiritual master also. It is the disciples’ duty to re-connect, serve & trust him whole-heartedly. To restore things with our honesty. But we must really not stagnate & do more and more service! The next morning Maharaj gave a morning class from Srimad-Bhagavatam 1.9.43, the chapter summarizing the passing away of Bhismadeva. We see that Bhismadeva was never distracted! 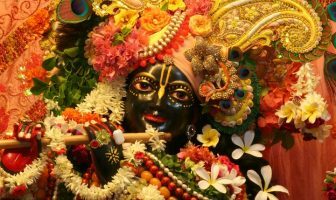 He had no attachment to this material as he was attracted to Krsna. So asrama is secondary, more of a support system, and not the end goal! All our acts are for Krsna ultimately. 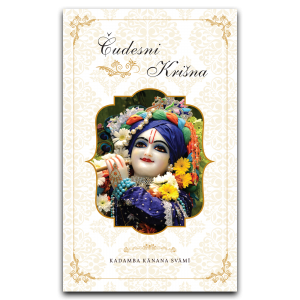 Maharaj told many stories of his experiences in Iskcon and was always leading toward the need of absorbing oneself in Krsna consciousness. So Bhismadeva boldly said he would kill the five Pandavas with these five arrows and Duryodhana was eager to keep them. 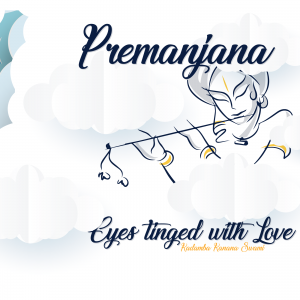 Then Krsna reminded Arjuna how he had previously saved Duryodhana out of family duties and could still ask any boon from him. So that evening Arjuna went and Duryodhana grudgingly had to hand over the five arrows. 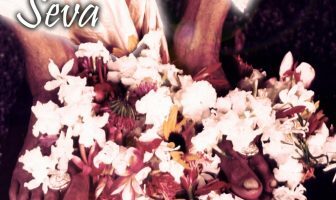 Bhismadeva, a personality dedicated to his vows wasn’t happy at all that now he could not fulfill his vow and therefore he wanted to make Krsna break His vow of not fighting. Therefore he really wanted to see Krsna in the fighting mood. It was at that moment where he saw his worshipable deity. The principle we see here is the sense of dharma which we must put first in life. The class ended with Maharaj glorifying the Mahajanas. ‘Maha’ meaning great and ‘jana’ meaning personality. So we see they are so-called due to their ability to deal with and handle such big issues. And now we know there are modern day Mahajanas, because only once in 1000 yugas does all the Vedas come to the west! And this was done by Srila Prabhupada. Later that evening, Thursday (06 October), Maharaj went to Stellenbosch University to give a talk and kirtan. Returning after a few years, Maharaj instantly knew the way around and led us all to the room for the event. Students and professionals began to come in and fill up the room. Then Maharaj sat down at the front with the harmonium and told us all, “I would sing every day and if there was ever a day that I didn’t sing it was a miserable one!” Then for an hour or so Maharaj sang and the whole crowd embraced the experience, closing their eyes and singing back loudly. You could feel the energy bouncing off the walls! 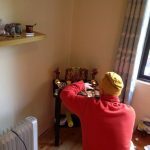 Then Maharaj began speaking about his experience of coming into contact with the Hare Krsna mantra, and before that the Rama mantra and his travels en-route to India. Only when coming into contact with the Bhagavad-gita did it satisfy the deeper personalism aspect he was looking for, so then he knew this was real. Maharaj could appreciate and understand the philosophy as he had seen the east. He had seen a dead body lying in the street and people throwing money on the body. Maharaj recognized the individual and ironically thought this beggar died in poverty and was now buried in money. But then someone explained the culture that they would burn the body on the day either before sunrise or sunset as the soul that had left wanted to come back in. So the living entity had to give up the body and must move forward to the next journey. So the Bhagavad-gita isn’t to be seen as a book but a way of life. It comes off the pages and we see it in the people and buildings all around us! So these books give us great insights and then we learn through life. Otherwise we die before we’ve died! Then to finish Maharaj ended by answering a few questions and then finally a short kirtan.